Google AdWords is one of the oldest and widely accepted PPC networks in the world today. But there could be various reasons for which you don’t want to use it anymore. One of the reasons could be it is not effective anymore for your product or your cost is exceeding your budget. 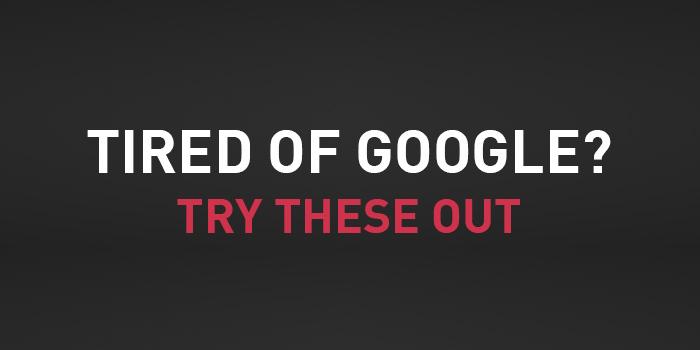 So, don’t be disappointed as we have made a list of 10 such alternatives to AdWords that you can try and see for yourself whether it works or not. Cheaper and effective substitute of AdWords, though it is not as effective as Google’s AdWords, it is the closest substitute and quite effective. Bing search engine will show your ads in the websites optimized with Bing. Your ad is more likely to get noticed in Bing than in Google AdWords. A less used but very effective alternative to Google’s AdWords, it has a very nice approach of intent-driven targeting, which helps a lot of people in their marketing campaign. It is cheaper than most of the other alternatives. Yahoo is not very popular these days but there was a time when Yahoo was considered the best search engine. It still has a good number of users. Another very good alternative which is good for ad retargeting and email retargeting, a little expensive though. It is a third-party platform approved by Facebook and runs its campaigns via FBX. Adroll offers open access using which you enable your audience to access via any device or browser. AdRoll provides transparency and control via which you can easily post an ad anytime you want. If you are an e-commerce merchant, then this is one of the best platforms for you to grow with the sponsored products which help the customers to land on your page and shop for the product. You need to pay a small amount of money but it will convert into sale directly. There are always offers from Amazon like great India sale and more, you can benefit from those campaigns as well. A platform which offers a wide range of services from advertising to branding and from programmatic to display advertising and the good thing is it is affordable. Helps in the acquisition of new audience and retention of old. They offer a live view of people’s behavior which helps you acquire a new audience. Quantcast is used by various brands like Buzz Feed, Vox, Slate etc. It is widely accepted and is worth your money. BuySellAds is one of the widest networks to offer banner ad services. They boast of having a huge turnabout of 6 billion impressions each month. A good transparent process brings a great opportunity to select from various good websites which have good content and the price which you pay for the services are not very high either. A very big ad network which has a variety of ads to offer and that to be at a cheaper rate. They have a user-intent and real-time engagement for relevant ads, this is thus far the best choice by the small traders. They offer six types of ads; Inframe, Intext, Intag, Inscreen, Infold and Inarticle. Infolink has its own space of client where he deals with some best businesses and helo them grow. We all know how Facebook has really changed the ways of digital transactions and has brought a whole new theme for it, Facebook is constantly bringing innovations and making the advertisement experience better. The advertisements for awareness and for conversion to sales, they are having a whole catalog of selection. All you need to do is to customize the ads according to your needs. An underutilized opportunity for the B2B where the companies could use this wisely. They chose to stick to their traditional techniques. It is one of the best Platforms to market your B2B products. LinkedIn is a good way to do branding as professionals are always online reading articles or watching videos. Your prospects are these professional people as well whether you sell B2B product or FMCG products. Pinterest is an image-based platform. People are benefiting from this platform tremendously because they are able to sell a story in the first place. Their products are sold but before that, they are able to convince their audience via Pinterest. Pinterest is providing good leads to the people. It instantly converts the lead into sales, one of the best platforms to directly convert a lead to sales. This is a good list to start with. You get to have your ads t cheaper rates and with better effectiveness. So, go ahead and select the platform which best suits your needs.